Most of our presents are now bought and wrapped (by Mrs Falaise, naturally. My wrapping skills are poor to non-existent). I’m trying to avoid the temptation to buy just one more gift for mini-Falaise and we are keeping our fingers crossed that the snow and ice won’t stop us getting down to mini-Falaise’s grandparents on Christmas Eve (or it will be a supermarket ready meal for Christmas lunch!). In short, we are almost ready. Santa Claus can start warming up for his big night. 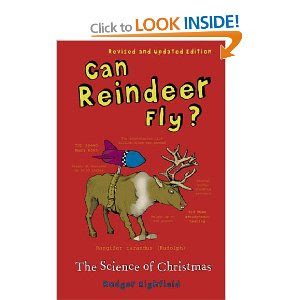 All these questions and more are discussed and answered in Can Reindeer Fly? by Roger Highfield. This is an odd but fascinating book which looks at a whole range of Christmas traditions and stories and examines the truth and the science behind them. It covers the maths, physics, chemistry, biology, psychology and history of Christmas, even dealing with Santa’s genetics. There are some absolute gems in here, such as the tale of how Richard Dawkins, evolutionary biologist and notable atheist, claims to have successfully disproved the existence of Santa to a six year old using the fact that Santa doesn’t create sonic booms, despite moving faster than the speed of sound. Yup, that’s right. A six year old child. What a lovely man. There is also a great little discussion of how Santa solves the problem of finding out what children want and where they live. I would try and summarise it here but it gave me a headache. I have a weakness for popular science books that dress up serious science or maths in a fun guise. One of the best of these is The Strange Case of Mrs Hudson’s Cat by Colin Bruce, which explains the basic concepts of physics via the medium of Sherlock Holmes stories. Genius for a non-scientist like me. I've also seen that Mr Highfield has written a book called The Science of Harry Potter, explaining how his magic could really exist (albeit using science!). I think I may have to check this one out next year. When you add in some wonderfully pointless trivia as well as the interesting science, Can Reindeer Fly? is a quirky, fun, seasonal treat, with a bit of education thrown in. Finally, there’s the added bonus that, having read this, you will have all the answers at hand if a precocious and annoying child starts asking awkward questions. I loved it but I can see that it is only really worth reading at this time of year. I have three more Christmas posts to come and we are moving into Christmas classic territory. Tomorrow, the Father Christmas Letters by none other than J.R.R. Tolkien, the first author to get a second post on this blog. * Santa and the reindeer fly at approximately Mach 6395, 6,395 times the speed of sound. This assumes, however, that he doesn’t stop at each house but lobs presents down the chimney. Although very fast, this speed is theoretically possible as it is slower than the speed of light. Good luck with getting to the grandparents! After a couple of scares over the last week, we´ve madeit to Lisbon last night with only one hour delay! Thanks! Well done for getting home. Good job you didn't have to travel via London - it's been chaos here. Agree with you on Dawkins - I think he is pretty humourless.